X-rays use a small dose of radiation to create pictures of the inside of the body. X-rays can be taken of any part of the body. They are especially good for looking at teeth and injuries to bones. There are no direct complications associated with getting an x-ray. However, the effects of repeated radiation doses may build up in the body over a lifetime, increasing the risk of some cancers or thyroid problems. The risk is higher in children and women who are of childbearing age or pregnant. Protective lead aprons and collars are used to reduce radiation exposure. Some tests and medical treatments cannot and should not be avoided. Talk to your dentist and doctor about the risks and benefits associated with the x-ray. Before your x-ray is taken, you may be asked to remove jewelry and put on a hospital gown. Let your doctor know if you are or may be pregnant. You may be given a type of contrast material. A lead shield may be placed on parts of your body that are not being x-rayed. This will help reduce your exposure to radiation. The x-ray device will be placed over the part of your body being studied. You will be asked to remain as still as possible while the images are taken. The x-ray device will send x-rays through your body. The x-rays will be captured on the other side of your body by a computer or on film. You will be able to resume your daily activities after the x-ray is complete. The x-ray will be sent to a radiologist. A report will be sent to you and/or your doctor. Radiation dose in x-ray and ct exams. Radiology Info—Radiological Society of North America website. Available at: http://www.radiologyinfo.org/en/safety/index.cfm?pg=sfty%5Fxray&bhcp=1. Accessed. Updated February 8, 2017. Accessed March 14, 2018. Reducing radiation from medical x-rays. US Food & Drug Administration website. Available at: http://www.fda.gov/ForConsumers/ConsumerUpdates/ucm095505.htm. Accessed March 14, 2018. X-ray (radiography). Radiological Society of North America Radiology Info website. Available at: https://www.radiologyinfo.org/en/submenu.cfm?pg=xray. Accessed March 14, 2018. X-rays. Mouth Healthy—American Dental Association website. 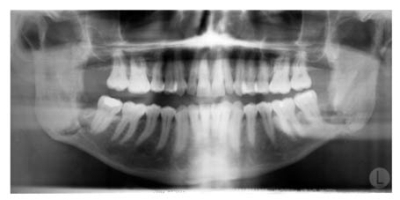 Available at: http://www.mouthhealthy.org/en/az-topics/x/x-rays. Accessed March 14, 2018.